This Custom GT86 Is my Lald Car Week! And Let’ start. The development code of this vehicle is 086A and its main production names 86 (pronounced “eight-six” or Hachi-Roku (ハチロク) in Japanese, but more commonly pronounced as “eighty-six”) or GT86, reference historic Toyota front engined and rear-wheel drive sports coupés and hatchbacks, and fitted in a FA20 H4 Boxer engine, RWD. Also called GT86, 86, BRZ. Had 3 Manufacturers Before, Scion, Toyota and Subaru. But since Scion Died in late Januarys. It was merged to Toyota so basically, it has 2 manufacturers now. Subaru and Toyota. I got it in played condition and wanted to restore. So i did, primered it and painted it Sky Blue. How did it get to chrome?!?.. Well it had paintchips and tried to make the chips black. And then it turned out ugly. So i decided to restrip and chrome the car out. 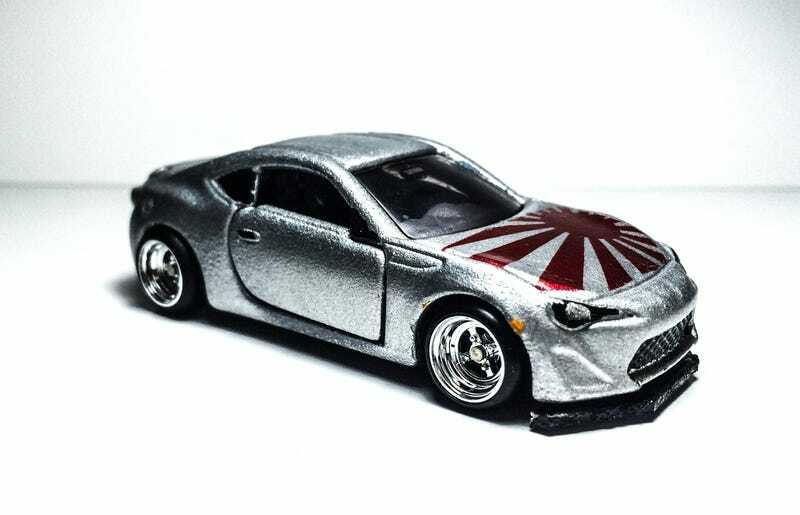 Detailed with Tamiya Acrylic Paint. This custom had been finished already 2 weeks before i got the HW 4 Spoke Wheels. So looks like that i waited 2 weeks just to put theese 4 Spokes on this 86. -Recently i just started a wip S2K and just removed its spoiler. Then when the 86 was finished, i had the idea to install the spoiler into it. Which is already finished.